I present to you the new Crowdfunding Collection #50, which includes every tabletop project started between till 08.21 till 09.04. Following a brief break you’ll find two new German projects. Most notably there is HeXXen 1733 from Mirko Bader, which offers a baroque setting plagues by various monstrosities in need of protection. Next to that, I extended my search for active crowdfundings towards the Spanish crowdfunding platform Verkami. Which currently aims to finance the translation of Barbarians of Lemuria as well as Little Fears. The projects are currently without a preview pictures, because I haven’t figured how to get the picture link. As for the English projects, I am fascinated by IDENTECOs cool Cyberpunk setting and atmosphere, which has a certain nostalgic flair. Westbound on the other hand is a card based Weird West role-playing game and Era: Belam extends the Era family with a SF game. HeXXen 1733 ist ein neues deutsches Pen and Paper-Rollenspiel, das Horror, finstere Märchen und epische Kämpfe vor der Kulisse des Barock in Szene setzt. HeXXen is the second iteration of a game by Mirko Bader. The setting, as the name suggest, is set in the baroque times of 1733. With the small difference that a broad variation of monsters and monstrosities roam the world. An aspect which will see the player characters fighting against various creatures and scheming to get allies. The system is of Mirkos own device. Though people who know Warhammer and HeXXen, told me there are quite some similarities (I haven’t played either). I’d be backing it, weren’t I saving up for my big vacation. In den Romanadaptionen der Kampagne von Bernhard Hennen und Robert Corvus erhalten wir einen neuen Blickwinkel auf die legendären Geschehnisse um Kapitän Phileasson, der in einer Wettfahrt gegen seinen Kontrahenten Beorn den Blender antritt, Aventurien zu umrunden und dabei schicksalhafte Entdeckungen macht. Wir erfahren viele neue Details, gerade über Beorn und lernen neue Figuren kennen. Aber gleichzeitig sind alle altbekannten Elemente enthalten und wohlige Nostalgieschauer sind garantiert. The book series covers the events of the „Phileasson“ campaign, an extensive adventure for game „The Dark Eye“ by Ulisses Spiele. It aims to offer present the world and setting in an engaging, fascinating and detailed fashion towards new players as well as proving established gamers with a nice, nostalgic feeling. The crowdfunding shall see the Phileasson saga get a proper, old-style, hardcover book treatment. If you are a fan of The Dark Eye, and proficient in German, it’s worth having a look. Take up sword and gun to seek fame and fortune in this gritty fantasy game set in modern-day Earth. A Table-Top RPG set in the Magical Wild West. Original 52-card Gameplay, Play Elves, Dwarves and Ogres as they explore the vast west. A new cyberpunk-themed tabletop roleplaying game where your identity has become the most valuable commodity on the planet. Simultaneous action combat in a world of mythological fantasy, inspired by ancient myths and cultures from around the world. I created a fantasy warfare and roleplaying game for pen and paper, I need help raising funds for editing and playtesting. Demons: The 9th Circle of Hell UNLEASHED!!! A card based, role playing, kingdom building, adventure game with dice. The best of everything all under one apocalyptic roof! An Arsenal of Animal Adversaries and Associates. Another collection of one-shot 5E Dungeons & Dragons adventures, designed to easily implement into your campaign setting. LED dice that light up when rolled. Cast a HEX and watch the magic unfold! Dice Eater Madness is Back! Ever wanted your own Mimic? You can have one now. Handcrafted mimic boxes and Pallet drink coasters for game night! The table-top gaming system you have been waiting for. Adjustable, expandable, durable and a lot of fun: Game your way! Ein cooler Spiel-Tisch, der sich auch als normaler Tisch tarnen lässt und dabei gut ausschaut. Wer einen Tisch sucht, und vor $749 nicht zurückschreckt, sollte es sich ansehen. Critical Fit is a fitness program with elements of classic tabletop role-playing games. Create a character, go on quests, and get fit! 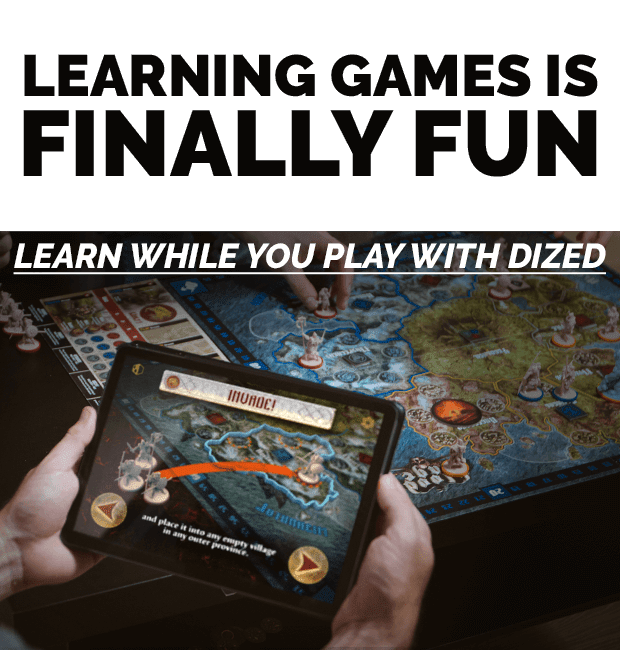 Dized – Start Playing Now! The ultimate companion app for board games: forget reading the rulebook, play right out of the box! I added the app because I like the concept. Which is basically presenting (board) game rules in an accessible, easy to learn fashion. Maybe it could be a thing for tabletop RPGs? I am making this for fellow digital tabletop players and game masters. Large expansive maps, player and monster icons, loot and traps. Chibi styled Paper Miniatures for your RPG’s and other games! Love dragons? I want to make 1.75″ hard enamel pins of the goodly Metallics! Get the shinies to hoard these dragons for yourself! A wondrous collection of Coloring Book Illustrations featuring Fantastical Monsters, Magic and Myth. Join the adventure! Addictive 10 min strategy game. Expandable to large multiplayer games. Battle On! A small card game, which utilizes the Pillars of Eternity setting. I do think it might be interesting for fans of the CRPG. All or One is an escape room where the puzzle is the people. A game of conversation, compromise, survival, and sacrifice. Bárbaros de Lemuria y Honor + Intriga son dos juegos de rol que utilizan el sistema de juego creado por el afamado Simon Washbourne (BoL). This project aims to translate „Barbarians of Lemura Honor & Intrigue“ into Spanish. It does look quite cool. This project aims to translate „Little Fears – Nightmare Edition“ into Spanish. It does look quite cool. Though I find it curious that they translate this, given they got Inocentes. Yet, for sure worth a look. Un nuevo juego de rol disponible en español e inglés que te llevara al limite, nuevas razas, clases y mas novedades. „The 8th Dimension“ would like to become a new tabletop RPG. Which is only described in one paragraph,… which stol…borrowed it’s only artwork from Magic: The Gathering. I would recommend to stay of it. The project aims to finance the fourth adventure for Eirendor „The palace of dreams“, which has the heroes try to brave an eccentric (nightmare) dream world. It does look quite interesting and worth checking out.